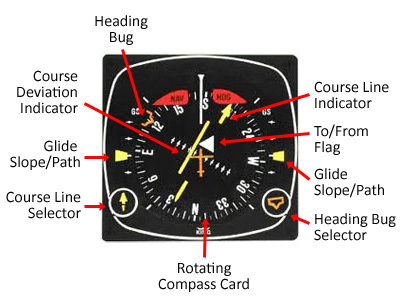 The horizontal situation indicator (HSI) is a key instrument in IFR flight. It combines the functions of a heading indicator and navigational indicator into a single instrument. For HSI questions, first determine the aircraft heading shown at the top of the indicator. This may allow you to rule out some answers. Next determine where the head of the needle points and the status of the CDI (either deflected or centered). Each dot on the deflection scale represents 2° of deviation. Thus, a full-scale lateral deflection represents a deviation of 10° or greater. In cases where an ILS is installed, a back course may be available in conjunction with the localizer. Like the localizer, the back course does not offer a glideslope, but the back course CAN project a false glideslope signal and the glideslope should be ignored. Reverse sensing occurs on the back course using standard VOR equipment. With a horizontal situation indicator (HSI) system, reverse sensing is eliminated if it is set appropriately to the front course.